A ceremony officially recognizing the donation of $500,000.00 towards the Jodo Shinshu Center Kodoâ€™s Onaijin in 2003 was held on Friday, September 23, 2011 at 10:30 a.m. 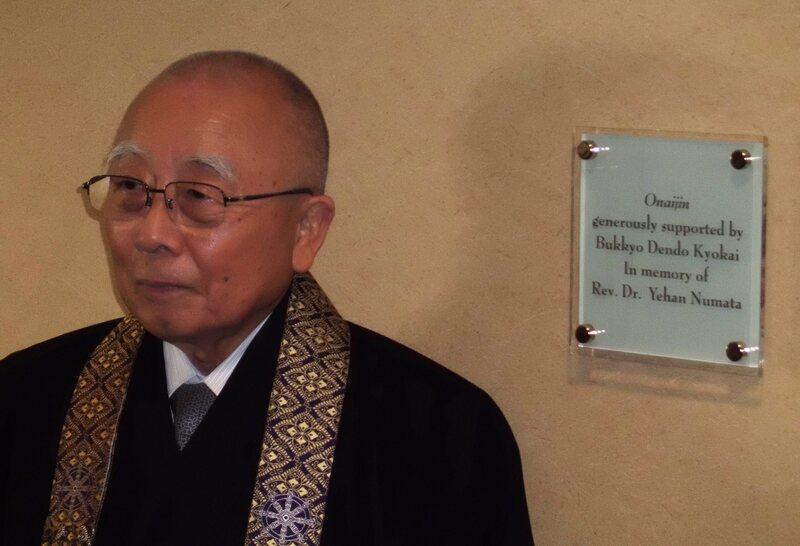 The Onaijin donation was made in honor of the late Rev. Dr. Yehan Numata, founder of Bukkyo Dendo Kyokai(BDK). Rev. Dr. Toshihide Numata, President of BDK, attended the ceremony. Also attending were: Mr. Mikiyo Yamashita, President of Mitsutoyo, America, and Rev. Brian Nagata, Director of BDK, America.Â Representing the Center were: Rev. Kodo Umezu, Director of Center for Buddhist Education; Rev. Kiyonobu Kuwahara, Director of the Hongwanji Correspondence Course; Dr. Richard Payne, IBS Dean; Rev. Dr. David Matsumoto, IBS; and Rev. Dr. Seigen Yamaoka, IBS. Following the recognition ceremony, Dr. Numata re-signed the document of a pledge of an additional $500,000.00 to the late Rev. Dr. Yehan Numata Chair for Japanese Buddhist Studies. â€œWe are deeply appreciative of the generous gifts provided to the IBS by the BDK and the Numata family over the years,â€ stated Dr. Payne.